Welcome, sorcerer apprentices! You are here for a lesson in spells. More precisely, it's the day of the exam, and you have to cast and recognize spells of all kinds: Leviosa, Torticolax, Petrificus... Who will be the best sorcerer apprentice? Take your magic wand and good luck to you because sometimes the spells will turn against you! 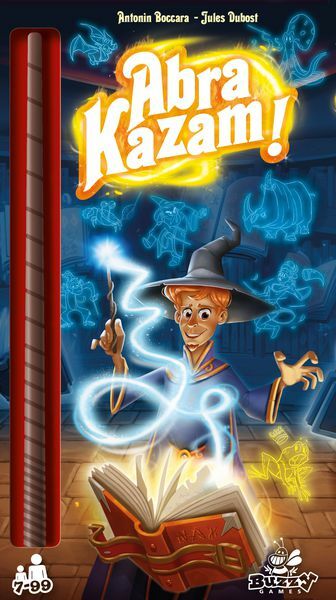 On your turn in Abra Kazam!, take the 24 cm. wooden magic wand, pick a card, then reproduce the gesture indicated on your card, trying to get others to guess your spell. The first player who finds the corresponding card on the table becomes the next sorcerer. Some spell gestures look quite similar, so it is not uncommon to be wrong in the rush! This new sorcerer has to act out the next spell challenge while following the command on the card just found, e.g., "Place the thumb of your hand holding the wand on your nose", or "Wedge your wand in the crook of the elbow", or "Your elbows must be glued to your body". The first player to collect five cards wins.